"Boy. Time sure does fly, Bamm Bamm. Remember when you and Pebbles were still crawling on the living room floor playing with Dino? Or when you had the cutest one-word vocabulary? Seems like just a few centuries ago when Fred would come home from the quarry to greet his loving wife and abnormally strong, infant son. Good times, those were. But it's time to grow up now, Bamm Bamm. Time to start being an adult. I mean, you outlived the dinosaurs and still don't have a real job. You haven't even changed your outfit, man. With all that strength and those sculpted muscles there's plenty of things you can do other than club people. Tell you what, we'll work on those people skills, get you a book or three and you'll be on the right track in no time." Now, if the legend of Bamm Bamm were still around, let's hope he'd be Yabba Dabba Do-ing the best he can. Hopefully he didn't need a reality check lecture and did A-Okay after his childhood Hollyrock stardom. 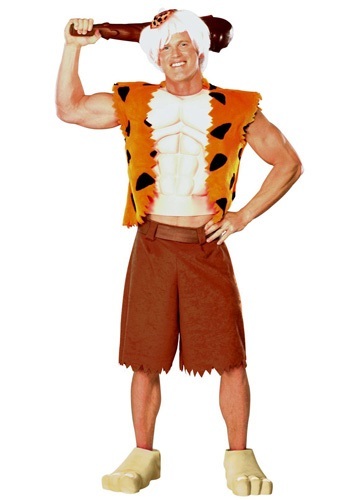 So, if you want to flaunt the results of Bamm Bamm's intense workout regimen, or his high sense of prehistoric, tattered leopard skin fashion, look no further. This costume is for you. Comfortable and fashionable, you can take the runway by storm with this Bamm Bamm vest and hat combo. It even comes with a club to fend off the paparazzi, if the caveman "bare-feet" shoes haven't already.